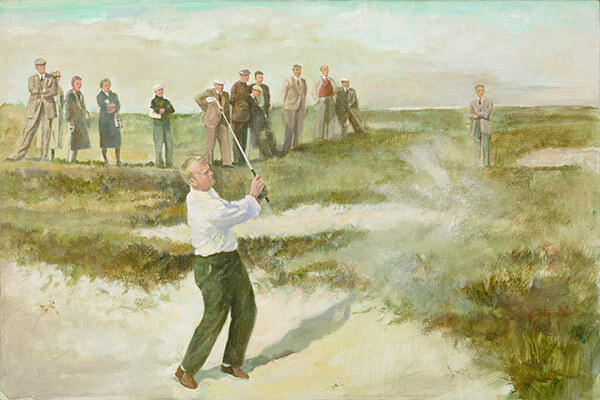 With his victory at Muirfield, 26-year-old Jack Nicklaus joined Gene Sarazen and Ben Hogan as the only players to complete the professional grand slam. For much of his career, Jack Nicklaus could dominate by virtue of his sheer power. “Today, everyone is long but back then, Jack was really long,” the late Bob Rosburg recalled several years ago. But at Muirfield, Nicklaus took one look at the 170 pot bunkers, the thick rough, and the menacing winds off the firth of forth and made a very wise decision: he would largely leave his driver in the bag. In fact, he only used it 17 times. After opening with rounds of 70-67-75, he came to the final nine holes in a tight battle with Doug Sanders and Welsh professional Dave Thomas. Nicklaus parred nos. 15 and 16 and just missed an eagle on 17. His birdie gave him a one-stroke lead on the home hole, which he parred for the win in the game’s oldest championship and at that time become the youngest member of the grand slam family.